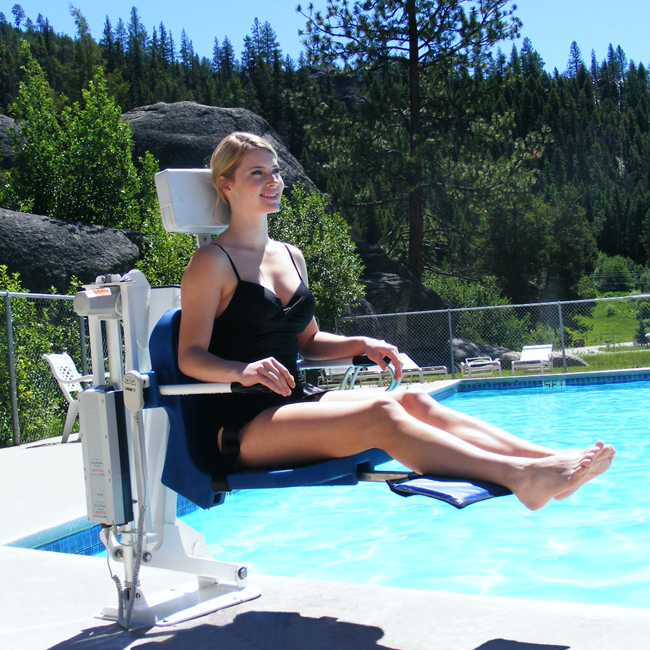 The Ranger Pool Lift from Aqua Creek is one of the most economical ADA compliant fully-powered pool lifts available. It is great for commercial and at-home use. This lift has a sleek, low-profile design. The Ranger can be transported and stored with an optional cart and has a 350 lb. weight capacity. A 4-point anchor is also available. Aqua Creek offers a 2-year limited warranty on this product, warranting that all structural components that have been properly installed, used, and maintained shall be free from defects in material and workmanship. The amount of weight placed on lift shall not exceed the rated lifting capacity of the product. This is considered abuse and will void any warranty. Never operate the lift under load in a dry pool (with no water in the pool). This item is covered by the Home Lift Pros 30-Day Return Policy with a required Restocking Fee. The item must be in new condition–no cracks, scratches or dirty tires. A Return Authorization must be requested from Home Lift Pros within 30 days of delivery. Once the Return Authorization has been received fromHome Lift Pros, the product must be returned within 14 days to receive a refund.